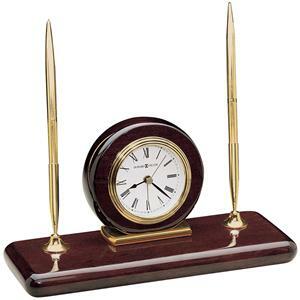 You'll be set with this table clock placed on your coffee table or mantle. The piece carries a Rosewood Hall finish on select hardwoods and veneers and features a brushed brass-finished top and base with polished edges and decorative brass handle. A white dial with triple rim, polished brass tone bezel and quartz movement with battery are also included. Accent your home in timeless style with addition of this attractive clock. The 613 Rosewood Bracket Table Clock by Howard Miller at VanDrie Home Furnishings in the Cadillac, Traverse City, Big Rapids, Houghton Lake and Northern Michigan area. Product availability may vary. Contact us for the most current availability on this product.